Usain Bolt has recently won the gold medal in the 100m of Beijing Athletics World Championships, with a time of 9″79, that is the 34th best ever time. The runs (100m and 200m) Carl Lewis did in the 80s would probably not win him any gold medal today; his jumps would still win him almost every gold medal today. 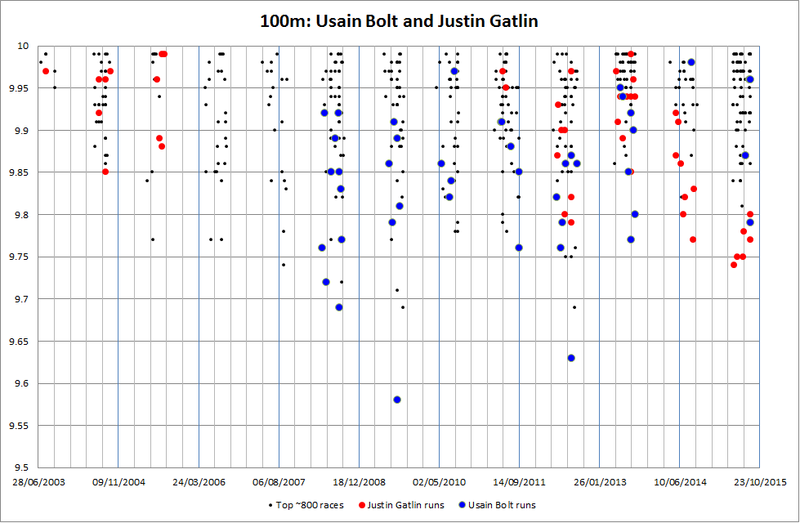 In this post, I want to compare Usain Bolt and Carl Lewis as 100m sprinters. I will use as a source again the website with all time best performances in track and field (maintained by Peter Larsson). 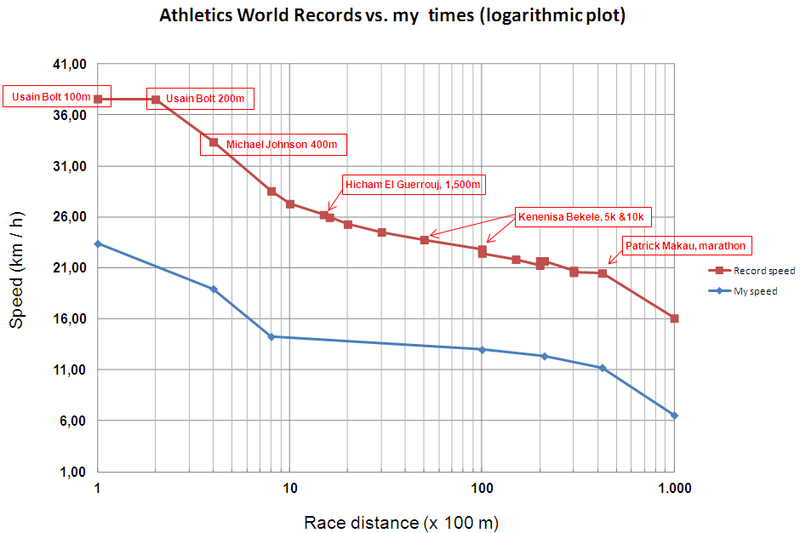 In the previous graph you can notice that times in the 100m have significantly improved since the 80s. 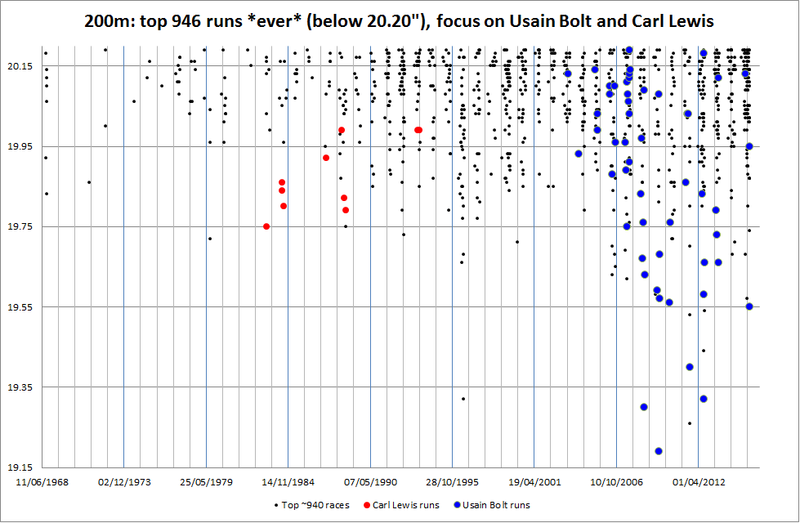 Usain Bolt is today way faster than Carl Lewis was in the 80s. 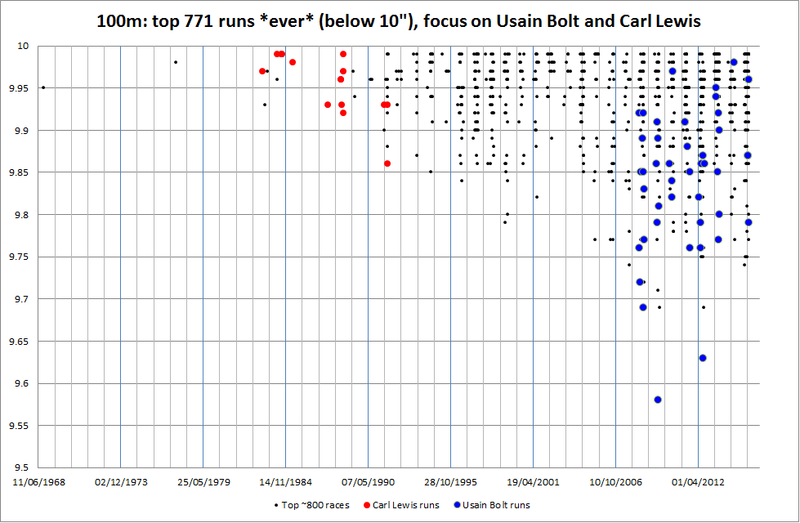 Compare that 17% of best times of Usain Bolt today (while he is running) with the 30% today (while he retired 18 years ago) of best long jumps of Carl Lewis. 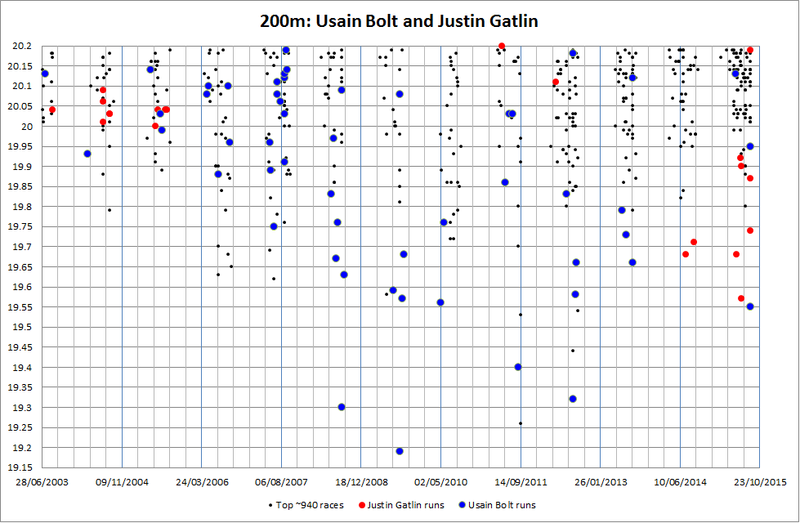 That speaks about the size of the figure of Bolt as a sprinter but, again, speaks a great deal about the figure of Lewis as a jumper and also about the different evolution of both events. I read earlier today an article claiming that Usain Bolt might be the best athlete ever (here, in Spanish). I do not want to dispute that with this post; by the number of olympic and world championship medals he has won and the records he has set, he might be so. However, in that article the author compared Usain Bolt (the runner) with Carl Lewis the runner. However, it happens that Carl Lewis was much more than a runner, he was a long jumper. In this blog post I just want to put into perspective the size of Carl Lewis as a jumper. I will again base the analysis on the following terrific website with all time best performances in track and field (maintained by Peter Larsson (1)). In the following two graphics you can see the best ~2200 and the best ~180 long jumps *ever*. 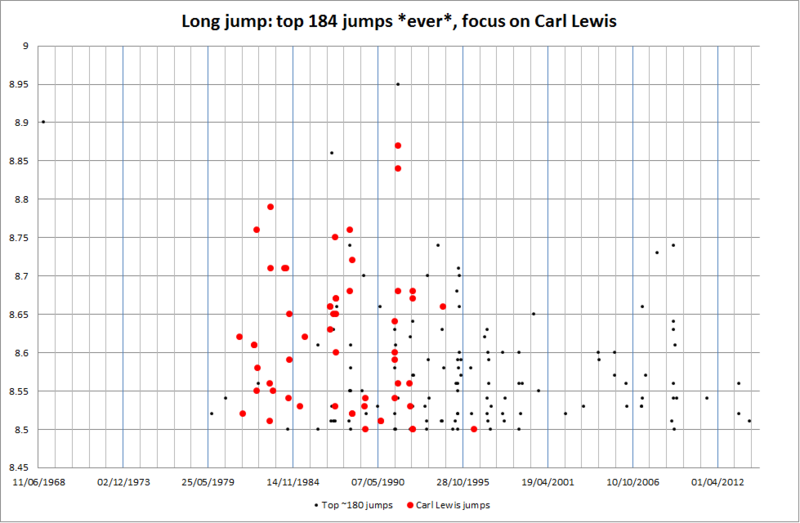 The red dots correspond to Carl Lewis’ jumps. 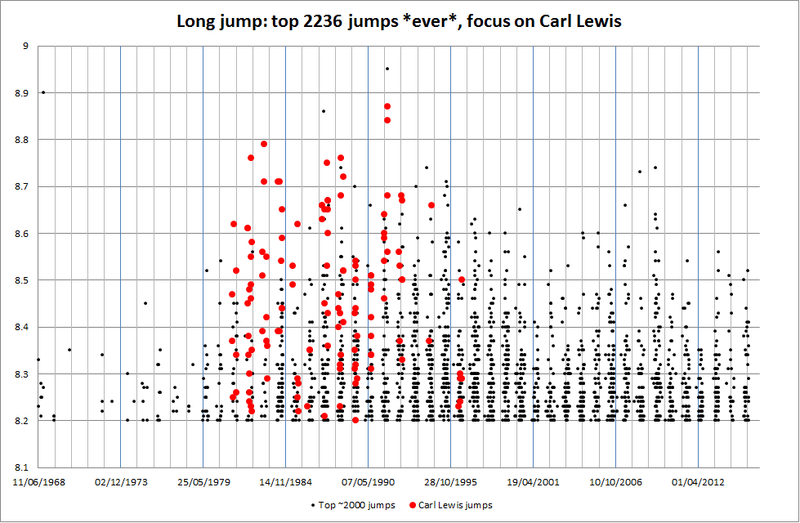 Best ever ~2200 long jumps, focus on Carl Lewis. Carl Lewis retired in 1997. His last great competition was the Olympic Games of Atlanta in 1996 (where, by the way, he collected a gold medal with a 8.50m jump at age 35). That was Carl Lewis the jumper. 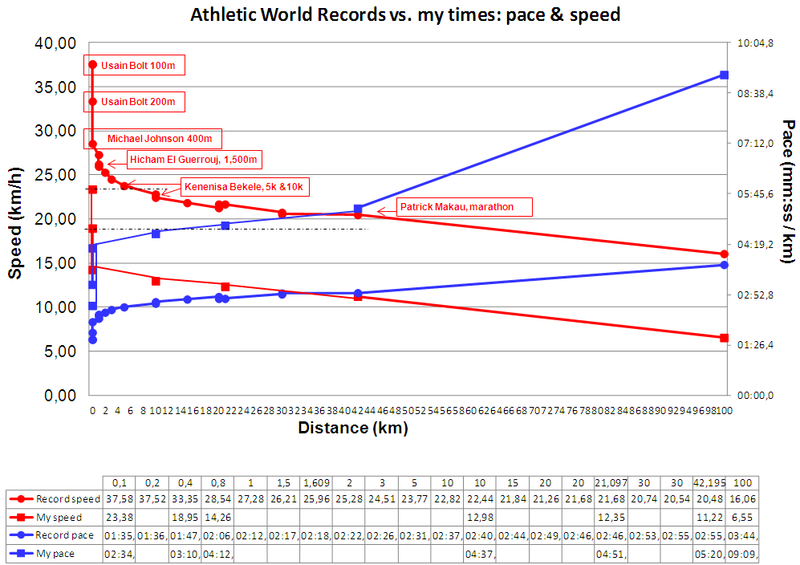 (1) I already used this magnificent source when I analyzed Rotterdam marathon times, here. (2) Personally, I would always pick a marathoner ;-). (3) I believe it would be interesting to share the World Championship long jump competition of 1991, when Mike Powell managed to set a new long jump world record (8.95m), 22 years after Bob Beamon had set the previous one in Mexico DF (8.90). Find the explanation from the Wikipedia here. Despite of losing it, Carl Lewis managed the following four jumps in that competition: 8.91 (wind aided, therefore it doesn’t count for world record and best ever jumps), 8.87, 8.84, 8.68 and 8.56. The first 3 jumps would have won *any* competition in history except 3, including the two world records referred. Unluckily for Lewis, these jumps got him only a silver medal.